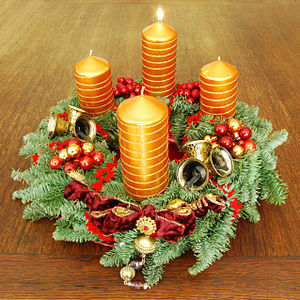 Today was the first Sunday in Advent. Advent means “coming,” and this season is for quiet reflection and waiting for what is to come–the birth of Jesus. It seems like the children started talking about Christmas early this year. Maybe it started after Aub’s birthday in September. I can’t remember exactly, but it for sure started in earnest after our Princess’ birthday two weeks ago. I know it’s part of being a child, dreaming and wishing, but I could only take so much. I don’t like all the “I want” talk. I especially cannot handle the lists changing ten days out. Enough is enough. And we have enough. So I started a “new tradition” last week. On Wednesday I told my crew to write their letters, finalize their lists, whatever it took. Wednesday was the last day to pick their three things to ask for. They are allowed to put three things on their lists. They might get other things, they might not, but the three is a good guide to let them dream and not go too crazy. Wednesday. Now there will be no more talking of wish lists and “what I want for Christmas.” That’s the new rule. Shhh. Tight lipped. Tick-a-lock. My thinking was get it out of the way and then let’s enter the Thanksgiving season, with an emphasis on Thanks as well as Giving. So now we are in the waiting period of Advent in our home, but I’m also going to challenge us to celebrate a time of Giving. Each day I want us to think of something to do or give (not necessarily bought–we’re gonna get creative here) to surprise someone. How much fun could that be? Yes, I know, it could be stressful, but I’m going to do my best not to let it become so. As Mama would say, “It’s all for the fun of it.” And it’s time to make our own fun. Because you are never too old to run and hide and play games with your siblings or your children or surprise someone out of the blue. It’s all about sharing the Love and Light and Hope in the darkness. Wanna join us? It’s bound to be an Adventure for sure. **from the song “Christmas is Coming” Here. Take a peek. And yes, it’s the Muppets version. Focusing on fun here, remember?